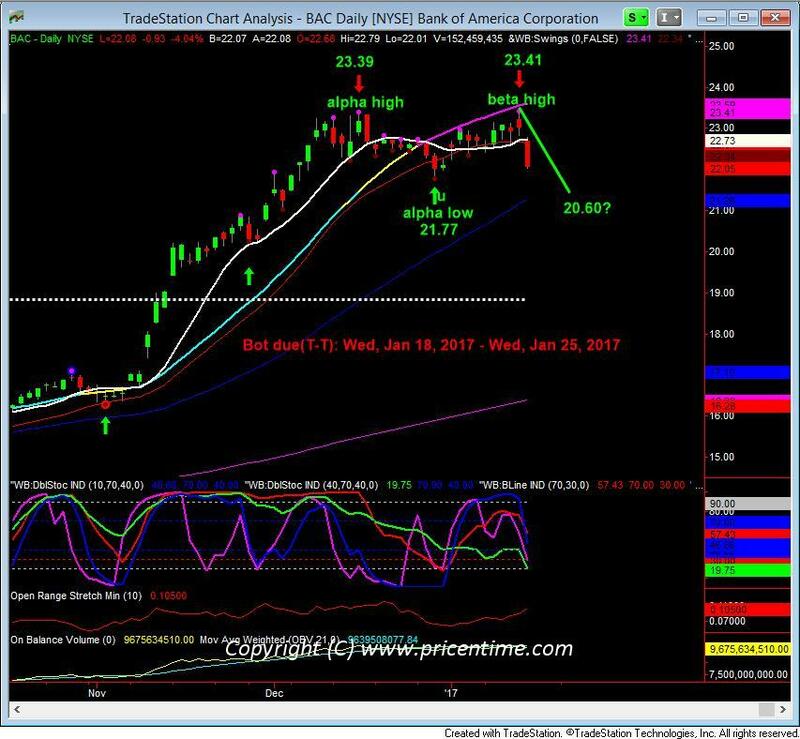 We shorted BAC at 23.22 on Friday Jan. 13, 2017. Our stop loss is 23.41. Since we opened the position, we never had paper loss on the open equity. Today was the 11th bar in the third daily cycle. The daily cycle went on schedule without a hitch. It gapped down at open and bears were in control the entire day. The fact it closed very near the low of the day indicates that it will probably gap down or have a very brief bounce on the upside and then resume the selloff tomorrow. We project the selloff will last at least until Jan 25, 2017 to test 20.60 level. Stay tuned. This entry was posted	on Tuesday, January 17th, 2017 at 7:58 pm	and is filed under Hot Stocks, Trade Recommendation. You can follow any responses to this entry through the RSS 2.0 feed. Responses are currently closed, but you can trackback from your own site.